Years ago, my husband and I had a fancy anniversary dinner at Wolfgang Puck’s “Spago” restaurant in Las Vegas. For our first course, we had the best smoked salmon appetizer I’ve ever tasted in my life — crispy potato cakes topped with a mixture of smoked salmon, capers, and green onion, and then drizzled with sour cream. The crispy/tender potato & salmon combination, combined with the tart/salty/lemony flavors were just heaven in my mouth. For days afterward, I couldn’t stop thinking about or talking about how perfectly delicious that smoked salmon appetizer had been. I finally decided to try and recreate the appetizer at home. It came out great, but it took a loooong time. I had to peel and shred potatoes, form them into patties, and then fry them in oil on the stovetop until they were perfectly crisp (but not burnt). So I sought out a way to make my favorite appetizer in a simple way. Tater tots make the perfect swap in this recipe because they produce the same salty/crunchy/potato-y texture, but there’s much less effort involved. 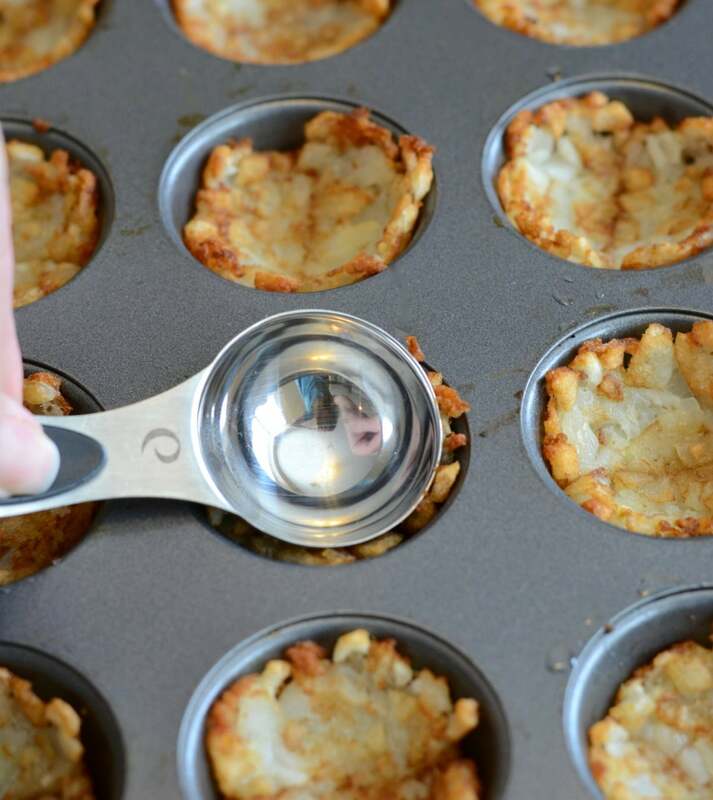 All you need to do is press some thawed tater tots into a mini muffin tin, create an impression using a rounded spoon (see photos), and bake until crisp. 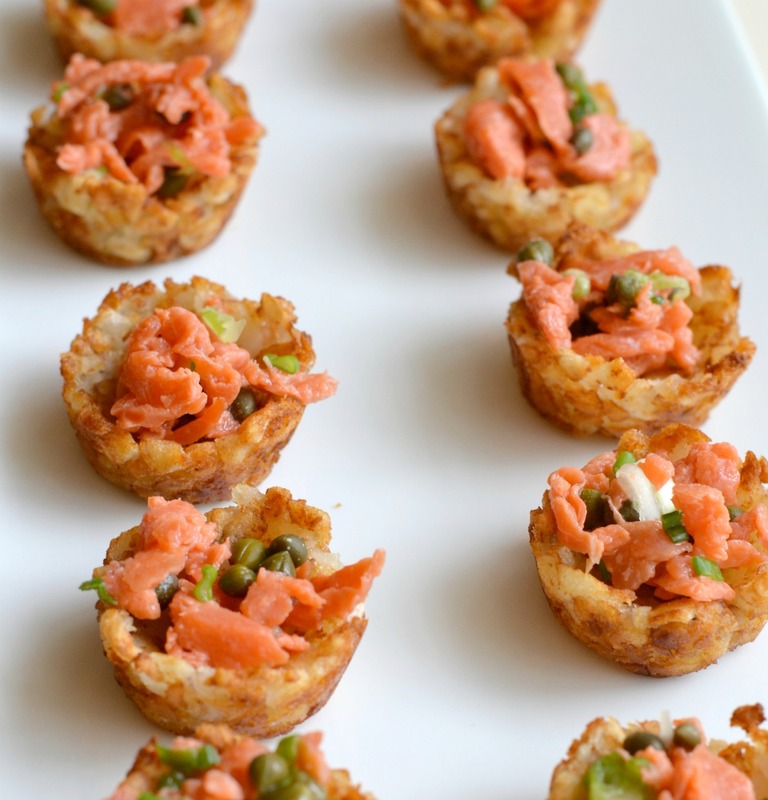 You just top the tater tot cups with a mixture of smoked salmon, lemon juice, green onion, and capers, and then drizzle with a bit of sour cream or plain greek yogurt. This drizzle is optional, but I love how the tart & creamy sour cream rounds out the flavor and texture of this smoked salmon appetizer. It’s the perfect little bite. And one more thing…this is the ideal appetizer to serve with champagne. Smoked salmon and champagne are a pairing made in heaven. 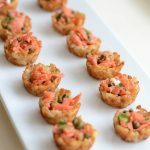 Modeled after my favorite appetizer from Wolfgang Puck's restaurant, this easy smoked salmon appetizer will be a hit at any party. Combine the salmon in a bowl with lemon juice, green onion, and capers. Set aside. 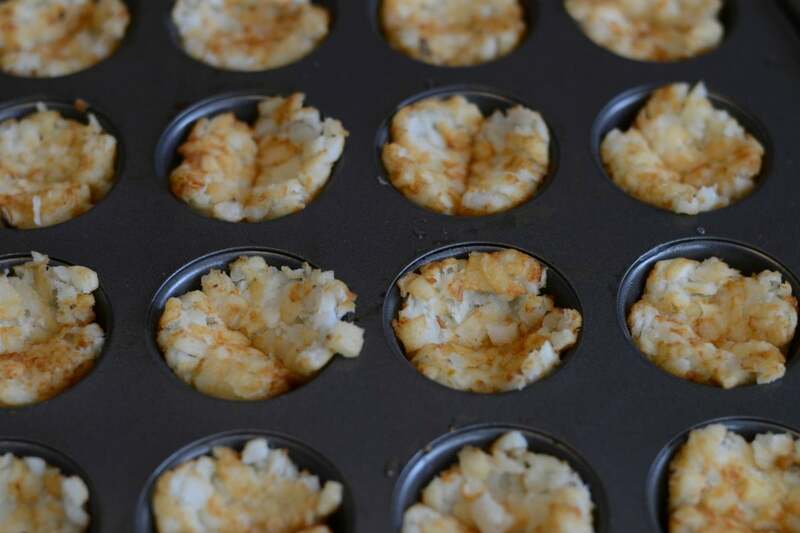 Lightly grease the cups of a mini muffin tin. Press two tater tots into each cup. This works best if you use a round spoon or another object to smush the tater tots into the tin. 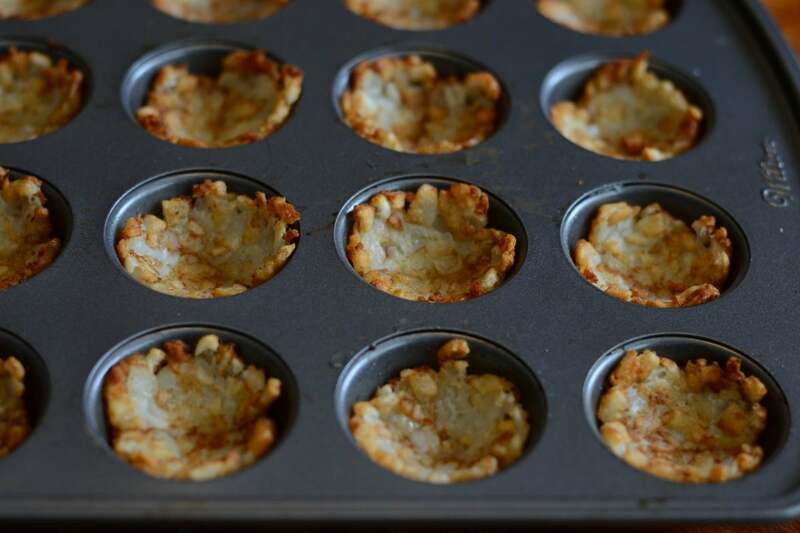 Bake according to package instructions, or until the tater tots are golden brown and crispy around the edges. Remove the tater tots from the oven, and use the spoon to push into the center of the cooked tater tots once again, creating a "cup" shape. Top each cup with the salmon mixture and a small dollop of sour cream or plain greek yogurt. I love the idea of potato crisps. I am going to try this idea soon. Thank you for the inspiration. These would be great for party food. I love anything with smoked salmon. I love what you did with the tater tots! This recipe sounds very yummy, I am going to have to try it.